Remembers Chat Peypoch and the signature look that she (he?) uses for the graduation photos of students from exclusive all-girls Catholic schools like Maryknoll/Miriam, Assumption, Poveda, St. Scholastica, and St. Theresa’s College. Who is Chat Peypoch? Is Chat Peypoch a she or a he? Is Chat Peypoch still alive? It appears that there are two photography studios in Makati but it looks like they don’t even have a website. In any case, even without the Chat Peypoch signature on the lower right corner of the photograph, one would have a difficult time not recognizing that “black and white on white background” style that is synonymous with the name. 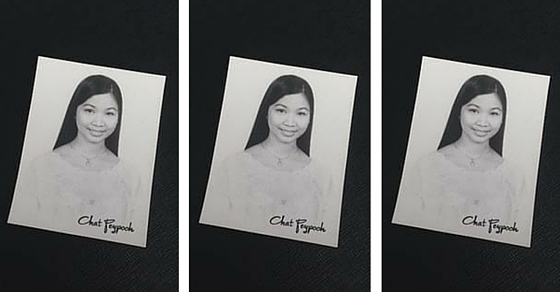 Thousands of fortunate Filipino female students have been immortalized with that indelible look. Hi Ricky – “Chat” was a she, I met her in person in 1992, and she was a famous portraitist in the olden days (like post WWII), which is probably why her portraits look “classic”. I stumbled across your post because I was also wondering whether she is still alive and can’t find anything on the internet about it. Anyways, glad I was able to help. If you ever find out let me know.